A painful shoulder paired with red skin may mean you need medical attention. However, the cause could be something simple like a sunburn that may resolve on its own. Several other possible unrelated conditions could cause such symptoms. Consult your doctor for a diagnosis and proper treatment. Parvovirus infection is an extremely contagious ailment that usually affects children, but may develop in adults. A bright red rash that presents on the face and may travel down the shoulders to the arms or down the torso to the buttocks is the most distance characteristic of the condition. The rash is rare in adults, but sore joints is common -- though not as frequently in the shoulders as the wrists, ankles, knees and hands. Parvovirus usually requires little treatment. The Mayo Clinic advises that parvovirus infection can be more serious for pregnant women, people with weak immune systems and people who are anemic. A bad sunburn can cause red skin and pain on your shoulder or anywhere that you exposed to sunlight. Your skin may be red, tender and even warm to the touch. The red skin can progress to blisters within a few hours or days. Skin peeling is possible after a couple of days. According to the U. S. National Library of Medicine, chills, nausea, fever and a rash may indicate sun poisoning, which is a severe reaction to a sunburn. An allergic reaction or side effects from taking medications could also explain your shoulder pain and red skin. For example, the medication lexapro may cause neck and shoulder pain as well as a rash, according to Drugs.com. This medication can cause several related musculoskeletal and dermatological side effects, like muscle stiffness, cramps, acne and dry skin. Ask your doctor if any of the medications you are taking could cause side effects. If a tick bit your shoulder, you may develop Lyme disease -- also called borrelia or borreliosis -- leading to redness and pain around the bite. NetDoctor describes symptoms including skin changes, joint pain, muscle pain, drowsiness, fever, swollen lymph glands and headache. A red ring often presents around a pale spot where the bite occurred; the redness may spread over time. Heat rash is a common condition in children, but the Mayo Clinic cautions that adults can get it too. It occurs when sweat ducts become blocked and your sweat is trapped beneath your skin. The reason for the blockages is unknown. Adults tend to present with heat rash on areas of the skin where there is friction from clothing. Infants get it mainly in their neck, shoulders and chest. A type of heat rash called miliaria rubra causes red bumps. 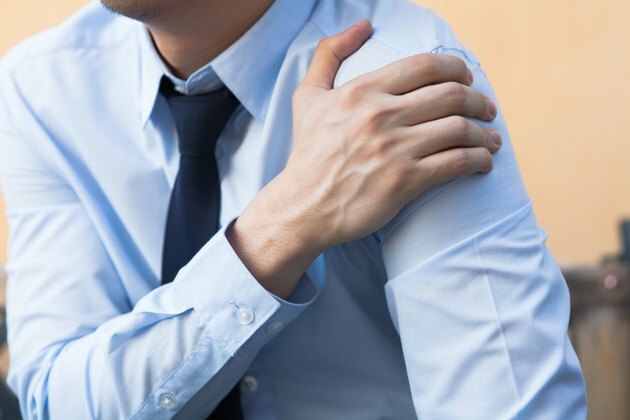 Medical care is usually not necessary, but see your doctor if you experience increased pain, redness, swelling or warmth on your shoulder or anywhere else.